0 Comments Published by Cedric Benetti on Thursday, August 16, 2007 at 8/16/2007 12:14:00 AM. What does a Palestinian look like? What does an Israeli look like? Men and Women, Israelis and Palestinians, agreed to cry, laugh, shout, and make faces in front of the photographers lens. Their portraits were posted face-to-face, in huge formats, on both sides of the security fence / separation barrier and in several cities. A necessary demonstration, through images, that art and laughter can challenge stereotypes. I finally found a good video collage on this "illegal" photography installation on the Wall of Shame by french artists JR and Marco. 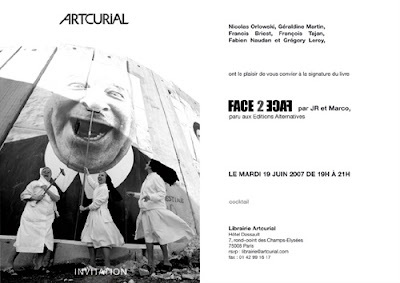 I was at their Vernissage at Artcurial earlier in June, where the artists were signing their book and showing the video installation.